WASHINGTON – The family of Capitol Hill shooting victim Miriam Carey has apparently lost patience with the glacial pace of the official investigation into the death of the unarmed mother, as their attorney made two major announcements. Eric Sanders is calling on Congress to investigate the shooting death of the 34-year-old dental hygienist by uniformed Secret Service agents and U.S. Capitol Police officers on Oct. 3. The attorney told WND no members of Congress have contacted the family. An unknown number of Secret Service officers and two U.S. Capitol Police officers involved in the shooting of the Stamford, Conn. woman have been shifted to desk work while the incident is under investigation. Sanders, who is a former New York City Police officer, said many “troubling” questions remain, but the main question is whether federal law enforcement officers were justified in firing at Carey. Officers fired at Carey on at least two occasions during a car chase that began at the White House, after she tried to make a U-turn at a checkpoint. At least seven shots fired in a crowded public space can be heard on a video recording after officers failed to stop Carey’s black Nissan Infiniti at a traffic circle just south of the Capitol. A few minutes later, officers shot Carey to death, a block northeast of the Capitol. It is not known how many shots officers fired at Carey while killing her because police have not released the forensics report nearly three months after the shooting. The Washington, D.C. Metro Police conducted the investigation into the killing of Carey. 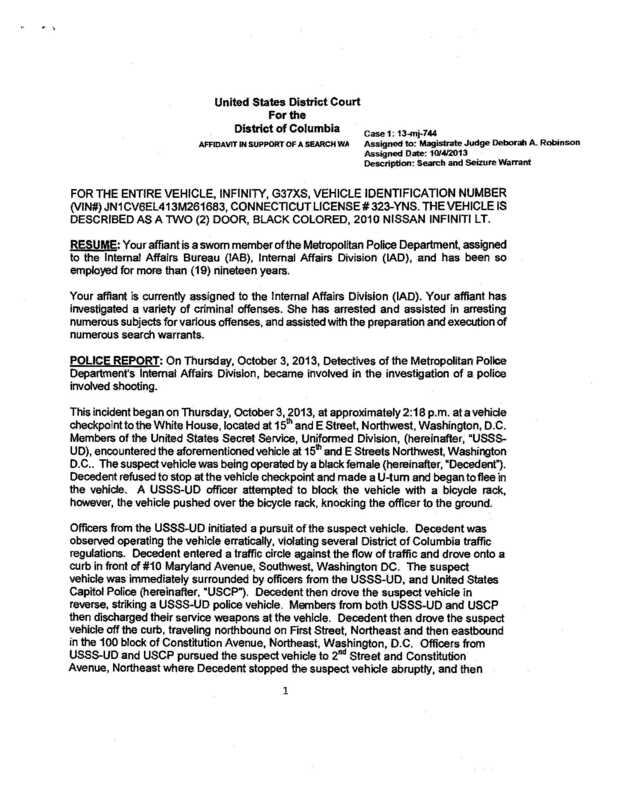 That investigation has been turned over the Washington branch of the U.S. Attorney’s office for review, which Metro Police told WND was standard procedure for officer-involved shootings. The U.S. Attorney’s offices is part of the Department of Justice. Sanders has written to Attorney General Eric Holder, requesting a civil rights investigation into the case, but the Carey attorney told WND he has not heard back. Sanders told WND he has spoken with the U.S. Attorney handling the Carey shooting investigation, but she would not acknowledge any investigation is underway other than the criminal investigation. Although many police departments, including the D.C. Metro Police, prohibit officers from shooting at moving vehicles, federal law enforcement agents may have more leeway. However, most of the legal and civil liberties experts who spoke with WND said it was still a mistake to fire on Carey’s car. Near where Miriam Carey was shot. WND photo by Garth Kant. 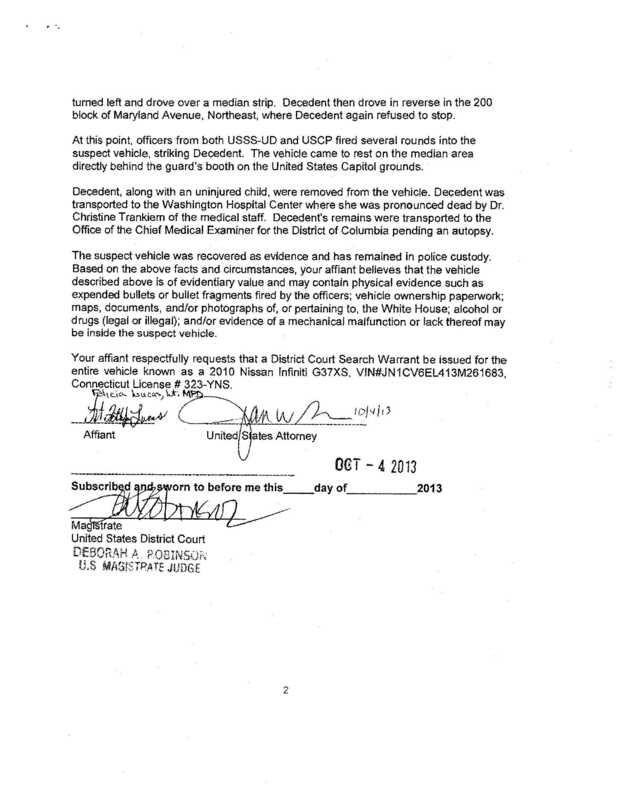 The fact there was a child in the car further complicated the decision to shoot. The initial police report did not say whether officers saw the child in the car. Mack said they had to have seen that a child was in the car, making the need for restraint by the police even more necessary. Furthermore, he said the use of deadly force under those circumstances should have been absolutely forbidden. Constitutional law expert John Whitehead told WND he believes police overreacted by shooting at Carey when they could have employed an alternative. He wondered, why didn’t they just shoot her tires out? All of the experts who spoke with WND agreed the incident was mishandled by law enforcement from the beginning, but it was also mishandled by the media. Mainstream media outlets such as the New York Times, NBC and ABC News all reported that Carey tried to ram a White House gate or checkpoint. Based on his experience in similar situations, Bongino, said he understood the actions of law enforcement officers in a fast-moving and confusing situation and loathed to evaluate their decisions in hindsight. Whitehead and Hentoff both told WND they firmly believe the case is an example of a growing “shoot first, ask questions later” mentality spreading across the nation among law enforcement agencies. They argue it is directly related to a change in training and a militarization of police departments across the country. Oh great. Sure…let’s get Congress involved. That should help clear things up. I wonder what they will call it….The Lifesucking Maggots Clapping After Murder Commission? They may have to bring Darth Cheney in for this one.